A status conference on the case against James Hataway was cancelled Wednesday after his lawyer told Circuit Judge Donna L. McIntosh that some discovery issues had, for the most part, been resolved. Jeff Leukel, attorney for Hataway, the man suspected in the Tracy Ocasio missing-persons case in Ocoee, told McIntosh that he had six more witnesses to dispose. Hataway did not appear before the judge. A Seminole County judge today ruled that when the man suspected in the disappearance of Tracy Ocasio stands trial in an unrelated attempted murder case, prosecutors can't say a word about Ocasio. SANFORD – A judge today ruled that when the man suspected in the disappearance of Tracy Ocasio stands trial in Seminole County in an unrelated attempted murder case, prosecutors can not say a word about Ocasio. She is the 27-year-old woman who was last seen leaving a MetroWest bar with Hataway in May 2009 following an Orlando Magic playoff game. Hataway has not been charged in that case, but he's in jail in Seminole, accused of choking and banging the head of another woman into the ground repeatedly after she refused his advances. At a pretrial hearing in the Seminole case today, Circuit Judge Donna McIntosh ruled that prosecutors may not mention Ocasio. Prosecutors did not put up a fight. Hataway, 30, is charged with attacking a 22-year-old woman as she dropped him off at his home near Casselberry Aug. 7, 2008. They had been with a group of friends at a bar then went to a party at a woman's home that night, according to a Seminole County Sheriff's Office incident report. Today, Assistant State Attorney Dan Faggard explained why the two left the party and why they left together: Partygoers accused Hataway of trying to steal steak knives or silverware and rifling through purses, so they asked him to leave. The 22-year-old woman offered to drive him home, Faggard said. "She was trying to be nice. That's why all these terrible things happened to her," he said. Assistant Public Defender Alexandra Steele asked the judge to bar that information at trial. The judge said no, that jurors could hear about it. There is no trial date. Defense attorneys today indicated they have been unable to find background records on one of the witnesses who says she saw Hataway attacking the Seminole victim and others who were at the party. Ocasio's father, Joe Ocasio, was at the hearing. Afterward, he said he was frustrated by delays in this case and in the investigation into his daughter's disappearance. He made eye contact with Hataway in the courtroom, he said. "I don't want to say what I feel," he said. Trimm, thank you for the updates. Mr. Ocasis assuredly had more control than I would have . . . I would have said exactly what I was thinking. Investigators in Apopka have found what they believe is a human bone in their search for a man connected to the disappearance of Tracy Ocasio. Onda Christopher George disappeared several months before the Ocoee woman was last seen in May 2009. Investigators believe Hataway was the last person to see Tracy Ocasio alive. Ocasio and Hataway were seen in surveillance video leaving the Tap Room bar in 2009. Investigators believe Hataway was also possibly the last person who was with 29-year-old George before he disappeared from Apopka. - Detectives with the Apopka Police Department tell FOX 35 that bones, believed to be those of a human, have been discovered in a retention pond near the intersection of Ocoee Apopka Road and Keene Road. 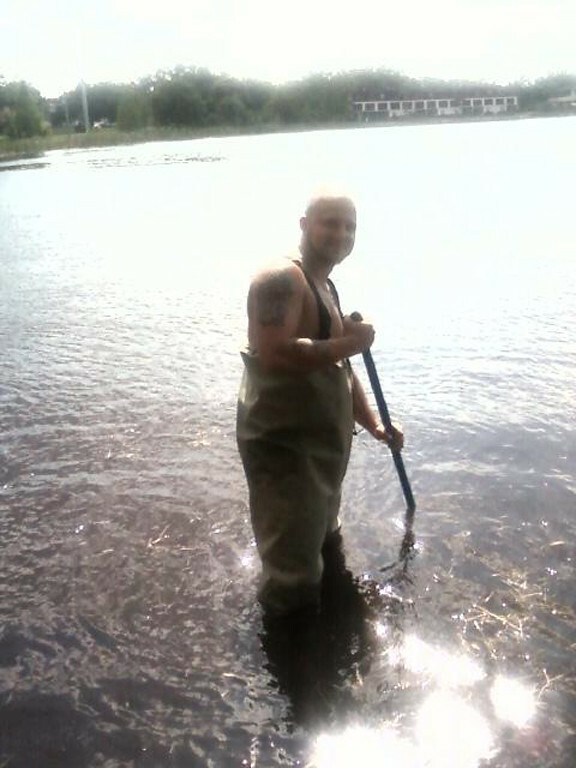 The search of the pond was conducted as part of an ongoing investigation into the 2009 disappearance of an Orange County man. Not long after Christopher George was reported missing, the 29-year-old's truck was located in a wooded area roughly 70 yards from an area where detectives searched on Monday. The pond had been searched previously, but the water has since receded, which afforded detectives the opportunity to do a more thorough survey. Investigators believe the bones are part of a human spine, though the gender of the victim could not be determined. The bones have been sent to a lab for testing. The disappearance of Ocoee woman Tracy Ocasio will get some national media attention this week by the Nancy Grace show. Ocasio disappeared in May 2009 after leaving a Metrowest bar with James Hataway. She has not been seen or heard from since then. The Nancy Grace Show is showcasing 50 missing persons cases from around the country in 50 days. Ocasio's case will air this Thursday. Thanks everyone for the links and updates. APOPKA, Fla. -- Apopka police said they found a possible human bone Monday afternoon in a wooded area off Ocoee-Apopka Road. Investigators were in the area searching for evidence related to the disappearance of Chris George, who vanished in 2009. APOPKA, Fla. -- Police in Apopka said they will begin a new search for evidence in a missing person case Tuesday after law enforcement officials told WFTV a detective found a human bone in a swampy area off Ocoee Apopka Road and Keene Road ( see map http://www.wftv.com/news/26949468/%20http:/maps.google.com/maps/index.html?oe=utf-8&client=firefox-a&q=Ocoee-Apopka+Road+and+Keene+Road&ie=UTF8&hq=&hnear=Ocoee+Apopka+Rd+%26+W+Keene+Rd,+Apopka,+Orange,+Florida+32703&gl=us&ll=28.64011,-81.539369&spn=0.012486,0.012982&z=16&iwloc=A ) Monday. Is human bone connected to missing people last seen with James Hataway? Investigators have been guarding Lake Carter overnight after detectives said they found what they believe is a human bone. Tests results on the bone should determine whether the bone belongs to one of two people missing from Orange County for about two years. * Onda Christopher George, of Apopka, has been missing since Feb. 12, 2009. He was 29 at the time. * Tracy Ocasio, of Ocoee, has been missing since May 26, 2009. She was 27 at the time. The two disappearances were 15 weeks apart, but investigators said they believe both George and Ocasio were last seen with the same man: James Hataway. Officials have not confirmed if it's a human bone. I wonder if this photo from Hataway's old myspace was taken at the same location? APOPKA, Fla. -- -- Searchers are combing an area Tuesday where a bone was found that could be a break in a missing person case. Apopka said they found a bone in an area where they once searched for Christopher George. APOPKA, Fla. -- A new search is underway Tuesday in Orange County as Apopka police are looking for evidence in a high-profile missing person case. An Apopka detective found Monday what they believe is a human bone, and investigators will spend the day looking for more clues. The detective found the bone in a swampy area off Ocoee-Apopka Road ( see map ). Investigators told WFTV it could be linked to Chris George. George's disappearance has been connected to James Hataway who is also a suspect in the disappearance of Ocoee woman Tracy Ocasio. Cadaver dogs and a team of investigators were out Tuesday in an all-out search for evidence. They are doing what is essentially a grid search of the area. "Nothing that they found yet is definite, so it could go in any direction," said Rachael George, the mother of Chris George (watch interview). Thank you for the updates Trimm. The waiting must be horrible for these families. Page created in 6.178 seconds with 20 queries.